"Our organization is a financially solid going concern but for the hundred lawsuits that we do have out there," Kathryn Carson, the chairwoman of the USAG board, said on a conference call with reporters. "That is the primary reason that we made this filing, to use the Chapter 11 process as a vehicle for resolving those claims." 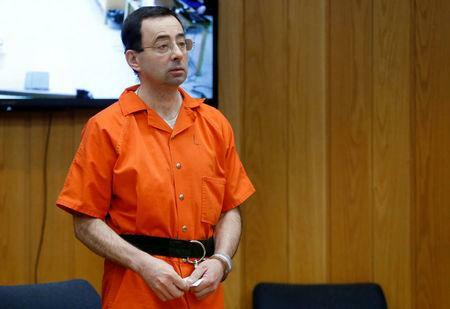 Nassar was sentenced to up to 300 years in prison in two different trials in Michigan last February after more than 350 women testified about abuse at his hands. The scandal prompted the entire board of directors at USA Gymnastics to resign, along with the president and athletic director at Michigan State University, where Nassar also worked. In its bankruptcy petition, the organization listed between $50 million and $100 million in assets and the same amount in liabilities. Among the biggest unsecured claims listed in the filing is a $340,000 severance payment for former Chief Executive Steve Penny, who resigned in March 2017 amid criticism of the way USAG handled the Nassar abuse scandal. The payment is “disputed,” according to the filing.